When it comes to the best social media channels to utilize, there is a specific divide between B2B and B2C marketing. The question is, should there be? Where can you find the biggest audiences? Where is the most engagement? Which is more important? 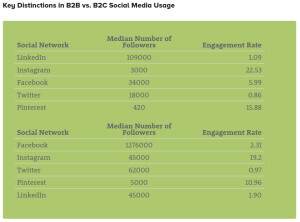 First let’s look at the channels available for both B2B and B2C. Here are the usual suspects: LinkedIn, Facebook, Twitter, Instagram and Pinterest. Yes, there are more and many emerge on a regular basis. For simplicity’s sake, let’s deal with only these for the purposes of this article. I believe most of us look at LinkedIn and automatically say, “B2B”. With Facebook? Obviously the best for B2C. And in the most general of terms, this is an accurate assessment. The audiences are definitely there. 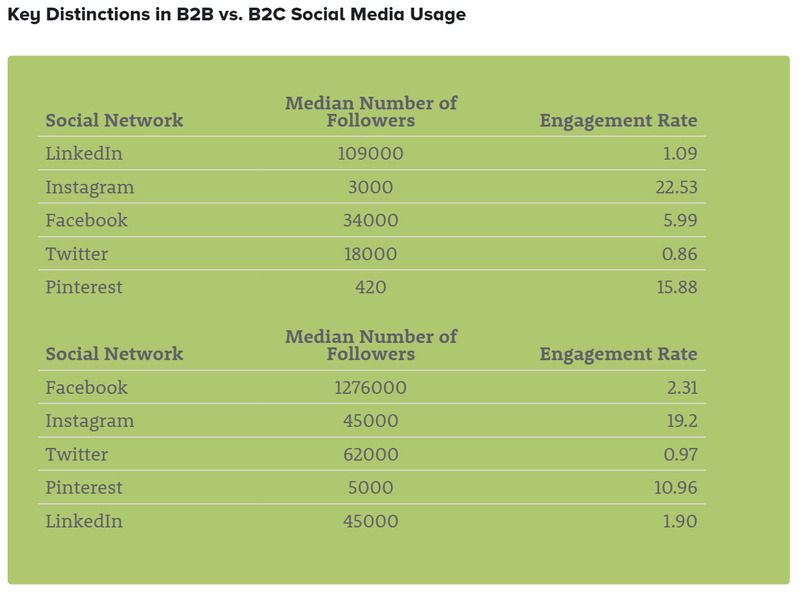 According to research performed by TrackMaven.com, the median number of followers on LinkedIn for B2B brands is 109,000, compared to only 34,000 on Facebook, while the median number of Facebook followers for B2C brands is 1,276,000 compared to only 45,000 on LinkedIn. Now let’s look at the engagement rates. This is where things get really interesting. Instagram is killing it for both B2B and B2C brands by huge margins! Check out the chart below. While audiences are important, and depending on your strategy, doesn’t engagement trump followers? Particularly when the engagement rates are so wildly increased by switching channels? Who would have thought that Instagram and Pinterest would be such powerful social mediums for B2B brands? While the followers are relatively low, the engagement is a marketer’s dream! So what do we make of this information? Clearly, making assumptions going into any social media strategy would be a mistake. A thoughtful and strategic plan, one which matches the message to the channel will be crucial to any marketer’s success. The days of posting a singular concept or message across all channels are over, and wouldn’t effectively harness the engagement levels of those channels. At the end of the day, it is important to recognize that it isn’t always just about B2B vs. B2C, it is about P2P; people to people, and our messages and strategies should always keep that in mind. 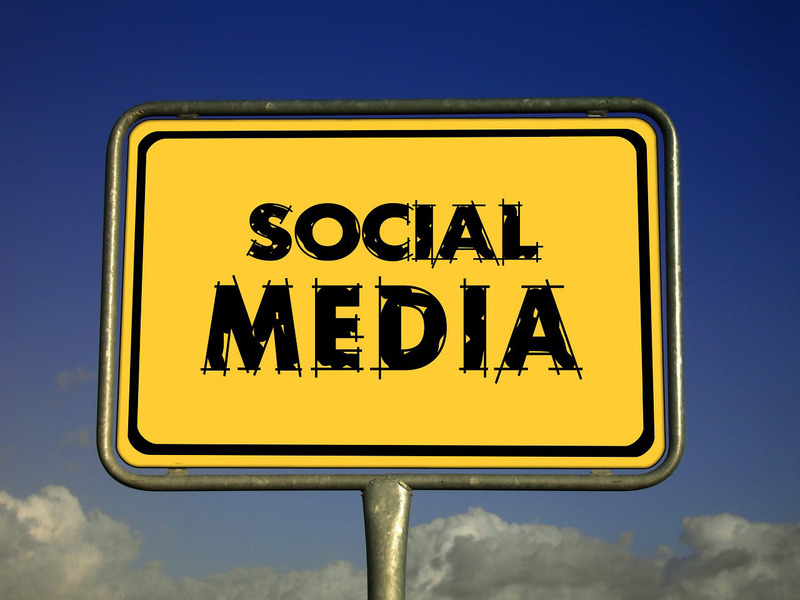 Need help with your social media strategy? Contact g2 media pros!